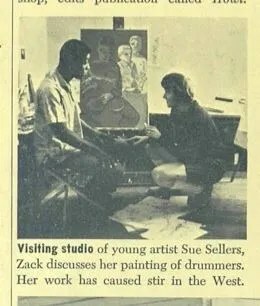 Sue Hoya Sellars is, was, and will always be our Art Matriarch. She inspired us to commit art, taught us how to paint the cosmos, drank Racer 5 beer like it was water, chopped wood until she died, and was the most awesomely fierce artist we know. 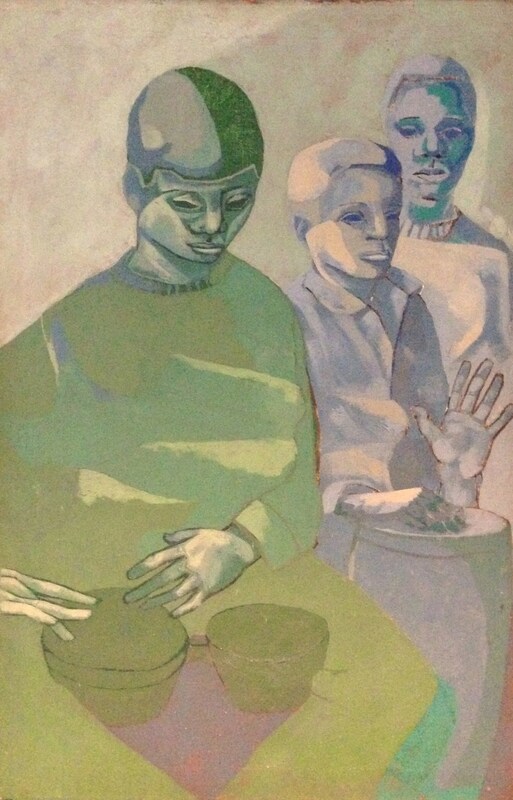 Fifteen years following the push for the WPA, Straus officially became Sue’s legal guardian as she mentored and had her trained in sculpting, painting, writing, and clay work, as well as in poetry and zen sumie ink technique and found other artists for Sue to study with to expand her talent. An upcoming exhibit in at the Greenbelt Museum is planned for 2015. 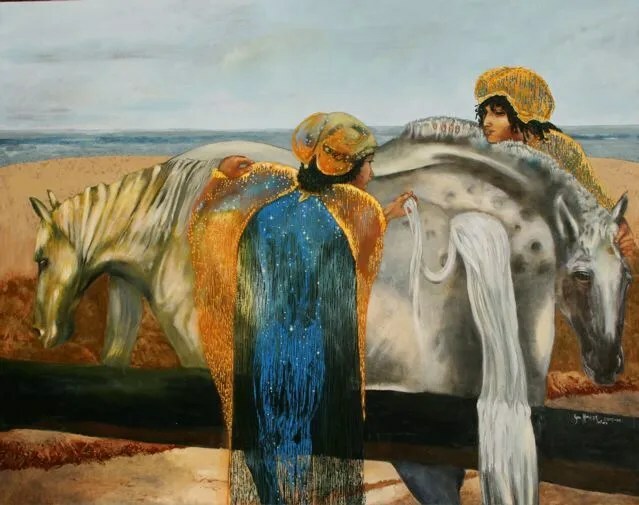 She began a career in art, during a time when most women in the arts who dedicated their life completely to their own artwork were very scarce throughout the United States. Her diverse interest in the arts and sciences brought her many powerful opportunities to share her work and her vision. Sue studied biological illustrating with Jan Roemhild, attended the Corcoran School of Art in Washington DC and the San Francisco Art Institute under the instruction with Wayne Thiebaud. She studied anatomy at the San Francisco School of Physicians and Surgeons while illustrating with Dr. Forbes and biological engineer, Hugh Hinchcliff. She was an illustrator for Janet Bollow and Associates for three decades, illustrating college text books covering Anthropology, Biology, Geology, Psychology, and Sociology. She attended the School of Electronic Art in San Francisco. She invited, and at times schooled, her community to redefine thinking, language and images of women and family through art and history. Her move to the Anderson Valley in 1975 was a chance to put her vision into action through co-creating sanctuary and ‘safe space’ for women as well as the building an art studio to produce work for sale and teach others. Here members of the women’s community were harbored and protected – Sue would have them chop wood and carry water – and milk the goats. Working hard, and working your body was a part of Sue’s teaching for women to find their footing in a dangerous world. Skilled in all mediums of working the land, and in art, she was a frontier woman in another surprising way. In the computer era of the 1990s, Sue brought her brilliant and mind expanding work into the digital world as a demonstrated innovator with the use of a Macintosh computer in ‘fine art painting’ through MacWorld expositions in San Francisco and the new online dictionary called C-Bold. Printing some of the first large-scale fine art giclées in the world from her mountaintop studio in Anderson Valley California, Sue knew that the power of digital image was here to stay. She later began showing and selling her digital artwork to the public in Sonoma, San Francisco and Mendocino. You can see Sue’s fine art and digital prints at www.suehoyastudios.com – and even purchase prints of her creations which will continue to be updated throughout 2015.